The A & B Stories: Ben loves spring! There's one thing we know for sure, Ben loves to be outside. I REALLY hope this is always the case. I too love being out, I feel so cooped up in the cold weather, and if it's even slightly mild I'm always wanting to spend the day out and about. These days at the park Ben is really into the slide, it seems to be his fav. The swing is just ok. His main fascination is usually the other kids...he gets so excited when he sees them running around playing games. I can't wait until I'm watching him do that! (Ok, yes, I can wait, but you know what I mean). I'm really interested in getting him into new activities this spring, but I'm not sure where to start. Any Mom's out there have any fun things they are doing with their little ones? Thanks so much for your post on my blog! Love your blog and it's great to find other artist mama's! 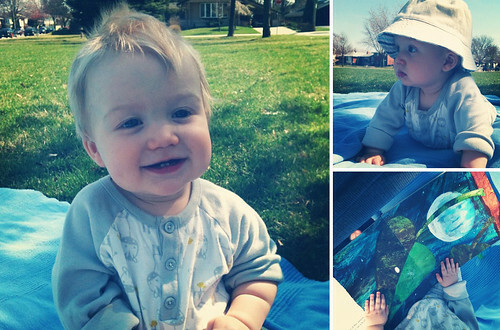 My son Max also loves it outside and spends a lot of time at the park by our house on Beulah Ave! We also checked out the Children's Museum in Gage Park and he loved it! It would be great to connect in real time! Hi Lisa! Great idea, I think I'll take Ben there!!! And yes that would be great! I used to live in your area...LOVE that part of town!